It’s here! 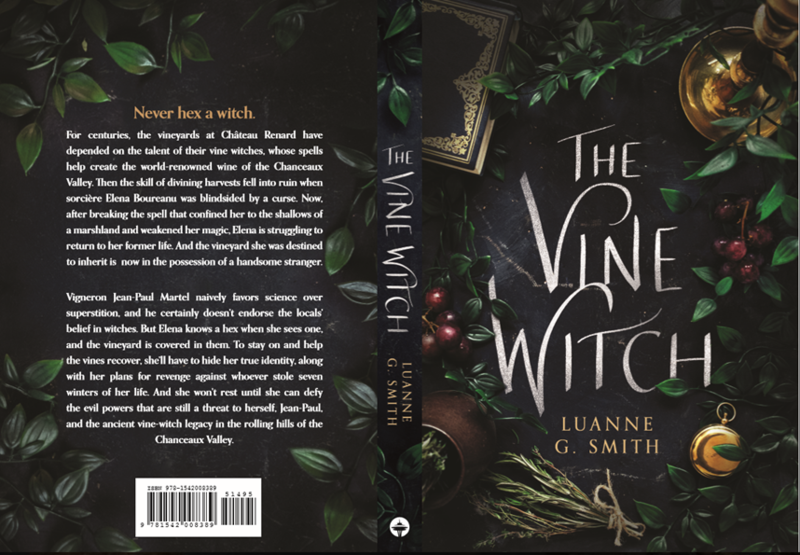 The Vine Witch finally has a cover and a blurb, which means the book is officially flying toward its release date—a very witchy October 1st, I might add. A young witch emerges from a curse to find her world upended in this gripping fantasy of betrayal, vengeance, and self-discovery set in turn-of-the-century France. For centuries, the vineyards at Château Renard have depended on the talent of their vine witches, whose spells help create the world-renowned wine of the Chanceaux Valley. Then the skill of divining harvests fell into ruin when sorcière Elena Boureanu was blindsided by a curse. Now, after breaking the spell that confined her to the shallows of a marshland and weakened her magic, Elena is struggling to return to her former life. And the vineyard she was destined to inherit is now in the possession of a handsome stranger. Vigneron Jean-Paul Martel naively favors science over superstition, and he certainly doesn’t endorse the locals’ belief in witches. But Elena knows a hex when she sees one, and the vineyard is covered in them. To stay on and help the vines recover, she’ll have to hide her true identity, along with her plans for revenge against whoever stole seven winters of her life. And she won’t rest until she can defy the evil powers that are still a threat to herself, Jean-Paul, and the ancient vine-witch legacy in the rolling hills of the Chanceaux Valley. Don’t forget to add it to your Goodreads list too! This time last year I was still writing the ending of The Vine Witch. I’d had good responses to the opening pages from a writing contest and early readers, so I was encouraged. I wrote and revised with an eye toward submitting to agents as soon as March…which, as any writer with a procrastination problem knows, stretched on for another two months. But I did finish (the most important step!). Late June I sent out a batch of four query letters, went on vacation, and winced every time I opened my email in anticipation of the inevitable rejections, even though these days it’s much more likely to never hear back. But lo and behold I got a request for the manuscript. And then another one. What??? I returned home from vacation and decided to send out two more test queries, and an hour later received another request. I knew then there was something different about this story. A week after I sent off that third MS request the agent contacted me to request a phone call. We set a time for the afternoon of July 9th, 2018, a date I’ll always remember because it was the day my mother died. It wasn’t an unexpected death, she’d been suffering from Alzheimer’s for years, but the Universe does like to announce itself in the strangest ways sometimes. The highest of highs and the lowest of lows came all in one day. The Vine Witch will be my debut, but it is the fourth novel I’ve completed. The first three manuscripts spent months, and in one case over a year, in the query trenches getting shot down. Pacing issues, unlikeable characters, predictable plot…I heard it all in those 200+ rejection letters. But this time things happened quickly. After two weeks and a handful of queries, I had an offer of representation. Then two weeks after going on submission I had a publishing offer from 47North/Amazon Publishing. It took more than ten years of writing with an eye toward publication to finally be able to say I have a novel coming out in the fall, 2019. A year ago I couldn’t have predicted any of this. I had hopes, yes, but we can sometimes get comfortable living with our unfulfilled dreams. It’s always a surprise when you actually get the thing you’ve been after for so long. Just like the dog who finally catches the car bumper with his teeth and wonders now what? It takes courage and stamina to chase down what you want, and even more to keep going once you’ve got it, but it is doable and it is rewarding. And it might just be around the corner for you too. I still don’t know what the future holds, but I wish you all good things as you pursue your dreams in the coming year. Looks like things are on schedule for a post Labor Day (2019) release date for THE VINE WITCH. The cover and jacket copy aren’t on the Amazon site yet, but should be coming together in the next few months. It’s all getting very real now. In the meantime, enjoy this gorgeous moon overlooking a vineyard. Very vine witchy. So, so happy to finally be able to announce that my novel, THE VINE WITCH, will be published by 47North/Amazon! It’s a historical fantasy story about witches, wine, and revenge set in early 20th century France, and I can’t wait for you to read it. Right now we’re looking at a Fall 2019 release. If anything changes, I’ll update here. Creative Commons Image of the Space Needle because, um, 47North.